To date, 622,000 refugees have fled Myanmar and crossed into Bangladesh. 60% of all these refugees are children and close to one in five are under the age of five. 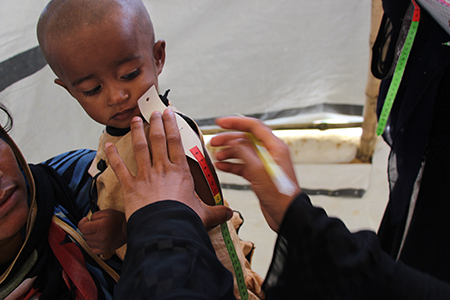 Almost one in four child refugees are suffering from global acute malnutrition. Many children have been orphaned and many are at risk of trafficking. Because of the desperate living condition in the camps, children are at risk to child abuse, forced or early marriage, and child trafficking. Child protection mechanisms must be established in the refugee camps/ settlements to monitor the protection and welfare of the children. The camp conditions are truly overwhelming. The Kutupalong extension site, which the Government of Bangladesh is developing, is one of the world's largest refugee settlements with an estimate 439,623 refugees. This site has multiplied by four times in the last 100 days. More than half a million refugee children facing urgent physical and psychological needs are living in appalling conditions in Bangladesh. They need a massive scale up in emergency assistance including food, clean water, shelter, toilets, washing facilities, medical and protection services. Hundreds of thousands of them are at great risk of deadly disease outbreaks due to crowded and dirty camp conditions and the arrival of winter in the coming weeks. 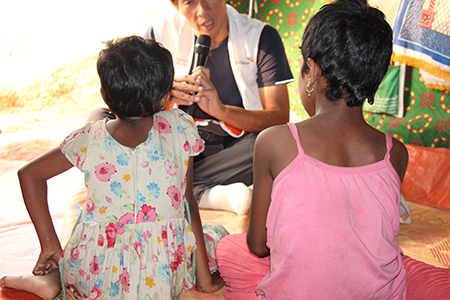 Watch to step into the camps of Cox's Bazar, when World Vision Singapore visited with Kiss92 FM! Since our last video on the Rohingya refugees crisis, little has changed for them. Over 600,000 new refugees are still there, each carrying the horrors of their flight from Myanmar. All trying to survive and make the best of their situation. No one wants to be forgotten, so as we head for our year-end holidays and reunions, let's not forget these children and their families. worldvision.org.sg/mbrc for how you can help provide some Christmas cheer. 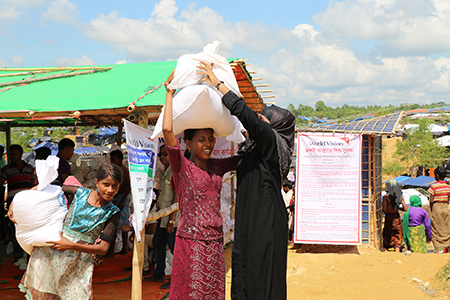 In partnership with World Food Programme (WFP), World Vision has completed initial emergency food distributions, reaching approximately 135,250 refugees. On the initial phase, we delivered aid at makeshift settlements and camps. Children have witnessed and fled extreme violence and need special care and protection. Most children fleeing Myanmar have had terrifying experiences. They have witnessed the killing, beating or abuse of loved ones, the destruction of villages, and have taken long and dangerous journeys to escape violence. They need special help to handle what they have seen and to make them feel safe. 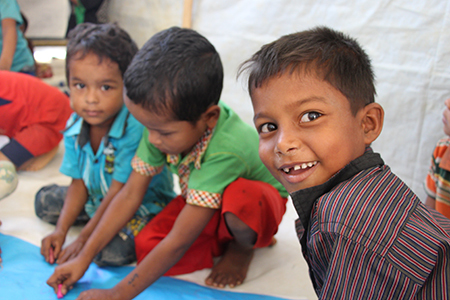 In Bangladesh, World Vision is one of six agencies responding directly to the needs of child refugees through psychosocial support, life skills training, and resilience programming. Some of the most vulnerable groups of this crisis are women and children, who are at higher risk to fatal medical complications from malnutrition and other diseases. There are an estimated 240,000 children and 120,000 pregnant and lactating women who need extra nutrition support. World Vision is setting up Women and Young Child Spaces (WAYCS), targeting at least 3,600 women and girls. Supplementary feeding to pregnant women and lactating women is planned. Inadequate water and sanitation, limited access to and lack of adequate facilities, high population density, and poor environmental conditions contribute to the increased risk of disease outbreak amongst an already vulnerable population. As per next six-month plan, safe water sources, gender-sensitive latrines and batching spaces will be installed. Promotion of proper hygiene and sanitation is planned. Shahida was running from the fires behind her. Her family including her grandma, sister and parents were all afoot. There was so much chaos that everything remains a blur in her memory. She remembers losing her parents in the frenzy – her father was shot, and her mother… she cannot remember anymore. Grandma dragged them along and begged for a boat at the river. There was no time to process their pain. On the boat, they thought they had a pocket of time to breathe. But then the bullets came – three at a go, and struck little Shahida in her arm, and close to her chest. She passed out. Grandma prayed, and got the sisters safely across the river. But Shahida was unconscious. There, humanitarian workers and a kind man from the Bangladesh army helped Shahida to the nearest medical facility. Today, Shahida lives with her grandma and sister in a little makeshift tent. Shahida’s little sister wants to be a teacher when she grows up. They try not to think of the pain anymore. They know too, that they will probably never see their mother again. THURSDAY, NOVEMBER 8 – Fresh reports from Bangladesh this week should be a wake-up call to protect children from immediate harm, says World Vision as is sounds the alarm about child trafficking in refugee camps. “Child protection issues are at the centre of the refugee crisis which include child marriage and child exploitation, and human trafficking. As different child trafficking groups are active in the region, children and adolescents, especially girls are vulnerable to trafficking,” says Tanzina Akter, National Coordinator, Child Protection, World Vision Bangladesh. It is common to see upsetting numbers of displaced and unaccompanied children being sexually abused, trafficked and exploited, and children fleeing Myanmar are no exception, says World Vision. Since late August, 605,000 people have crossed the border into Bangladesh, escaping violence in Myanmar. As many as 60% of these are children and many have been separated from their parents. “This means they are easy targets for traffickers. It also means their safety and security needs far more urgent care and attention than it is currently getting,” says Tanzina. According to UNHCR, international donors have pledged US$344 million to help deliver critical humanitarian assistance to refugees and host communities in Bangladesh. "We need to see a commitment within this funding to address the specific issue of protecting children, keeping them safe and out of reach of those who would prey on them,” says Jared Berends, Senior Director of Operations and Resource Mobilisation, World Vision Bangladesh. “It was 1am. He had already picked up my younger daughter, 4-year-old Fiza, but his hands accidentally grazed my older daughter and she got up with a start and screamed," says 35-year-old *Razia.“We didn't get a tarp the first week. We just had to get by. No food, no shelter, no medicines was very challenging. It rained sometimes and it was extremely hot sometime. The children were dehydrated and started developing fever along with a cough," she says. Having very little to work with, Razia and her husband tried their best to provide a secure space for their children; carpeting the wet mud ground and on the sides with a thin sheet of plastic was all they could manage. But the thin, plastic, tearable walls weren’t enough to keep the danger out.“There are no permanent walls on the sides of the tent. From one side it’s completely open. The shelter walls are so thin anyone can rip it open. That night was the most shocking. It was dark but the moon radiated some light. We were all asleep. I keep the little one in the middle and the older children sleep on the sides. A man entered our tent from the side of the tent and picked my 4-year-old." “Razia’s experience gives us an insight into the danger facing all children, but especially those who have been separated from their parents,” says Jared. “It takes being aware of the real risks facing refugee children, and taking intentional steps to scale up programmes to protect them." Friday, 24 November: "World Vision calls for safe, voluntary repatriation of refugees in Bangladesh"
COX’S BAZAR/ YANGON, 24 NOVEMBER 2017 -- Following the recent release of a Bangladesh foreign ministry statement announcing an agreement with the Government of Myanmar to start repatriating refugees who had fled violence in Myanmar back home within two months, World Vision calls on both governments to respect the right of all refugees to return in a safe, voluntary and dignified manner in line with international humanitarian standards. 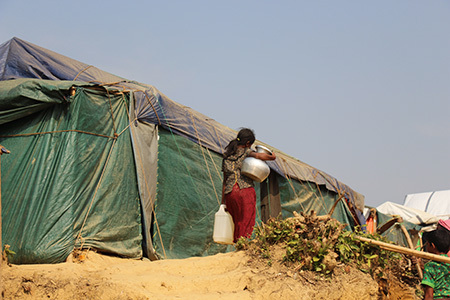 Some 1.2m people in Bangladesh’s Cox’s Bazar District- including those in overstretched host communities—need access to clean water and safe sanitation. More than 380,000 refugees are at risk of worsening malnutrition and need immediate interventions to stave off potentially fatal medical complications. As part of a six-month response plan, World Vision identified the following urgent needs in makeshift settlements accommodating more than 800,000 people: shelter, boosting measures to protect children from exploitation, food rations, nutrition assistance, and improving water and sanitation sources. “We continue our work plan, and are on stand-by to learn how the latest news of an agreement will affect the numbers over time. Our priority remains unchanged: For the children who return, as well as those who remain in Bangladesh, it is a moral, legal and ethical duty for all parties to protect them from all forms of violence,” said World Vision’s director in Bangladesh. In the five campsites where World Vision works, reactions have been mixed when refugees considered the prospect of return. All names have been changed to protect identities. Since fighting broke out on 25 August in the northern tip of Rakhine State in Myanmar, home to almost all those who fled into Bangladesh, humanitarian aid has been delivered exclusively by Myanmar Red Cross and the government. International NGO access remains restricted to conflict-affected areas. "World Vision’s operations in Myanmar stand ready to respond to the needs of the most vulnerable children and families, including those to be repatriated, as soon as access is reopened," said World Vision’s national director in Myanmar, Suresh Bartlett, who was clear about the challenges ahead. World Vision recently partnered with the multinational manufacturer P&G to provide one million water purification sachets that will be distributed in coordination with the government in Rakhine State. Expenses to cover refugees’ basic needs in Bangladesh until the end of March 2018 are estimated to cost USD 434m, while the cost of repatriation is yet to be estimated.